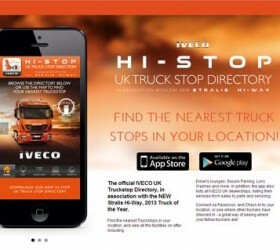 Truck drivers around the country are now able to find their nearest services at the tap of a finger, following the release of a freeiPhone and Android* app by Iveco – to coincide with the UK launch of its International Truck of the Year-winning Stralis Hi-Way. 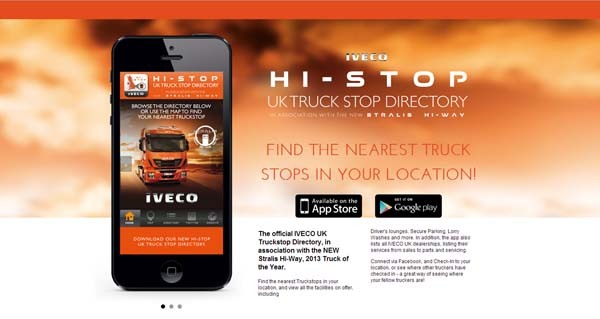 The easy-to-use Iveco ‘Hi-Stop’ app has a map function which shows every truckstop service station within a 50 mile radius of the users’ location, and lists the key amenities available at each particular stop. The Stralis Hi-Way replaces the previous Stralis Active Space and Active Space Super³ models and is designed as a highly competitive proposition for long-haul UK and international haulage, with one of the most modern premium cabs available on the market. It is joined at launch by the Stralis Hi-Road, in place of the previous Active Time model, for distribution and fleet operations as well as medium to long-haul domestic missions. Completing the new range is the Stralis Hi-Street which represents the day cab model and is aimed at short-haul distribution markets for rigid, tractor and drawbar applications – in place of the previous Active Day model. *The Android app is due to appear on the Google play store within the next few weeks.